Animal factories create breeding grounds for bacteria and pathogens, and increase the risk of widespread foodborne illness outbreaks. CAFOs also rely heavily on animal drugs to suppress disease and get animals to slaughter more quickly, posing food safety threats from resistant bacteria and drug residues. The poor living conditions characteristic of animal factories harbor dangerous foodborne pathogens. Harmful bacteria may be more present in industrial livestock due to corn and soy-based diets, which increase acidity and cause ulcers or infections in animals. In crowded living conditions the animals are likely in contact with their manure, exposing them to E. coli. As a result, conventional beef is more likely to contain bacteria and more likely to harbor antibiotic-resistant bacteria. Food safety can be easily and quickly compromised as a result of our concentrated production system. A single package of factory-raised ground meat could contain tissue from hundreds if not thousands of animals, and a single downed cow infected with a pathogen such as E. coli could contaminate more than 100,000 hamburgers with an infectious dose. Antibiotics are used to preventatively mitigate the negative health effects from poor living conditions, but their routine use puts both human and animal health at risk. Food animal production is the largest abuser of antibiotics worldwide and contributes to rising antimicrobial resistance. About 80 percent of all antibiotics sold in the U.S. are marketed to animal producers, and many are used to boost productivity, rather than actually treat sick animals. Human exposure to antimicrobial resistant bacteria is contributing to a public health crisis. Resistance limits the treatment options for infections making it more costly to find effective solutions. In September 2017, a report by the Center for Disease Dynamics, Economics and Policy, along with researchers from Princeton University, the United Nations’ Food and Agriculture Organization (FAO), and others demonstrated that limiting meat intake to the equivalent of one fast-food burger per person, per day globally could reduce antibiotic consumption in animals raised for food by 66 percent, and significantly help avoid a future in which antibiotics are no longer effective in fighting infections. That means limiting meat products to 40 grams/day. Animal drugs such as ractopamine, hormones, and several antimicrobials are regularly given to animals, raising significant concerns for food safety. Limited research on ractopamine’s human health impacts prompted the Russian Federation and the European Food Safety Authority to ban its use. Data on the direct effects from hormone exposure is also scant, but there is sufficient evidence that hormones in livestock still reach humans and have the potential for adverse health effects. Reducing overall consumption of meat and poultry proteins, sourcing certified humane, organic, and/or pasture-raised meats, and increasing portions of plant-based proteins in your diet can reduce your exposure to harmful pathogens and antibiotic-resistant bacteria. Beef that was raised without antibiotics, is certified organic, or is 100 percent grass-fed is less likely to be contaminated with Staphylococcus aureus or E. coli than conventional. 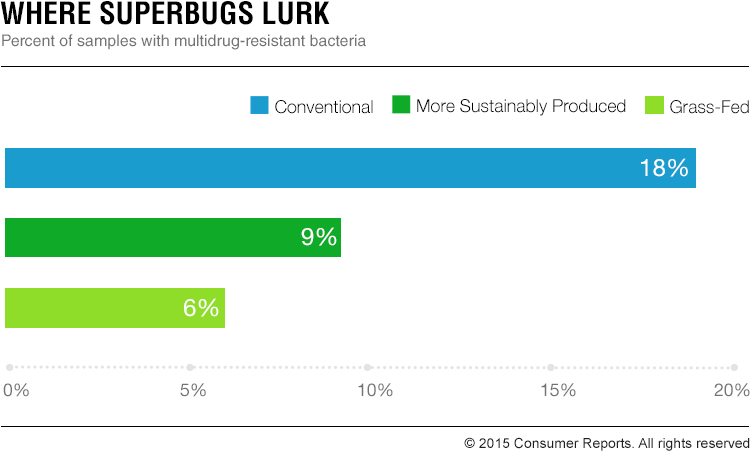 Sustainably raised products are less likely to have bacteria resistant to multiple antibiotic drugs than conventional meat and poultry. Organic crop producers are required to process animal manures in some way, such as composting, before using them to fertilize soils, reducing the risk of pathogens or harmful residues contaminating crops. Organic vegetables contain half the amount of nitrates, which are harmful in high quantities, as conventional vegetables 94-100 percent of organic food is free of pesticide residues. The Food Safety Modernization Act (FSMA), acknowledging the increased food safety benefits of organic agriculture, requires that all new FSMA regulations must align with the strict standards of organic production.